From highway one, most of the sloughs are hidden. They wind around farms, fields, and low hills not visible from the highway. Access points are not marked on most maps, which makes them difficult to find. Most are in private ownership, but a few roads cross the many fingers of the sloughs allowing glimpses into their hidden lives. An excellent source of information on visiting the sloughs is the City of Watsonville's Wetlands and Trails webpage. There you will also find the wetlands trail map shown below. Click on the links below for information on accessing other sloughs that are not accessible from the City's trail system. Watsonville Wetlands Watch is actively involved in the maintenance of the trail system. In season, you can go on a free Wetlands Alive! tour. Click here for more information. Click map above for larger version. Hanson slough is located west of Highway One and Lee Road. Its upper reaches can be seen from Harkins Slough Road. West of Lee Road it feeds into Watsonville Slough midway between Highway One and San Andreas Road. Unfortunately, it is not readily accessible to the public although acquisition efforts are underway. 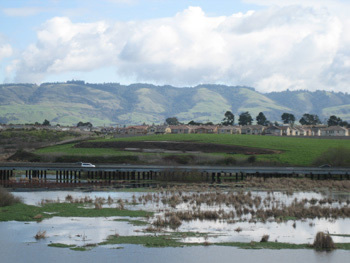 Harkins Slough is the largest and most north-reaching slough in the Watsonville system. It receives drainage from Larkin Valley and flows eastward under Highway One, between Buena Vista Road and Airport Boulevard. Here it broadens, often flooding Harkins Slough Road. Gallighan Slough, which is inaccessible, merges into Harkins Slough at a point below the county landfill. Harkins Slough continues south and joins Watsonville Slough east of San Andreas Road. It can be viewed from Harkins Slough Road west of Highway One. Struve Slough begins near Pennsylvania Avenue and Green Valley Road, draining behind Watsonville Square Shopping Center and crossing under Mains Street, Harkins Slough Road, and Highway One before joining West Struve Slough between highway One and Lee Road. Struve Slough often floods Lee Road. It can be viewed from any of these roads. 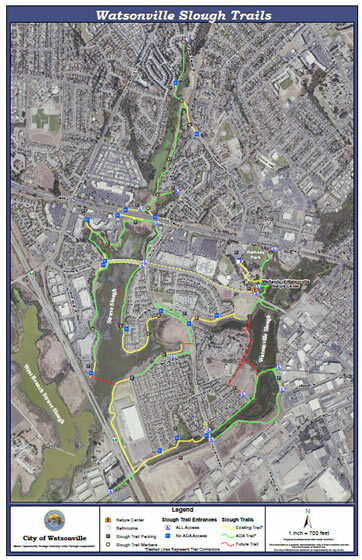 The City of Watsonville is planning to install a slough-side walking path. West Struve Slough originates off Airport Boulevard, crossing under Highway One near Harkins Slough Road. It Parallels Highway One and Lee Road along its course to its juncture with Struve Slough. 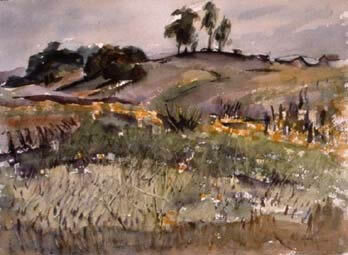 It can be viewed from Harkins Slough Road west of the Highway, and from Lee Road. Visitors can also obtain permission from the California Department of Fish and Game to enter the Ecological Reserve between lee Road and the Highway. Find out more about the DFG Ecological Reserve in the upper reaches of West Struve Slough. 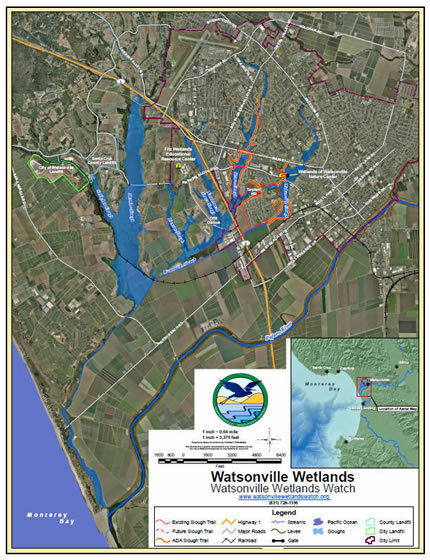 While for much of its course Watsonville Slough appears to be little more than a drainage ditch, it is in fact the backbone of the system that drains the rest of the sloughs. It includes several important wetlands at its upper reaches. 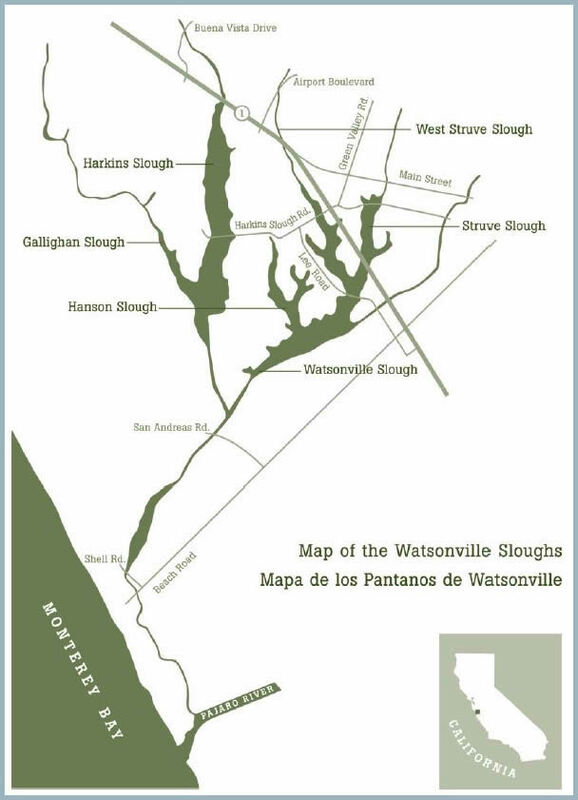 From its origin along Ramsay park in Watsonville, Watsonville Slough passes under Main Street and harkins Slough Road and thence under Highway One, Lee Road, and San Andreas Road. It is pumped into the lower, tidal reaches at Shell Road and flows under Beach Road to join the Pajaro River at Monterey Bay. It can be viewed as a ditch paralleling Beach Road to the ocean, and as a tidal slough as it widens at Palm Beach.